South Florida is constantly regarded as one of the most incredible locations in the United States, and for good reason. We’re known for having incredibly year long, as our winters never seem to rarely drop below 60 degrees. The ocean breeze cools us as we relax on the soft white sands of our coastal beaches. Although South Florida upholds its official nickname of “The Sunshine State” for the majority of the year, this usually isn’t the case come summer. For South Florida, summer is hurricane season. Rather than going outside and enjoy the fantastic weather like every other state, South Floridians are preparing for the mighty storms that are slowly inching their way towards them. While many will barricade their homes and stock up on supplies, they forget about one of the most important things during a heavy storm: power. Some rely on portable generators to power key appliances should the power go out, while others gamble that they won’t lose power at all. Unfortunately, whether you do or don’t lose power is completely out of our control. Strong winds from hurricanes, tropical storms, and sometimes even regular thunderstorms can knock over and destroy power lines. This can cause houses to immediately lose power and be left in the dark. Depending on the severity of a storm, you and your family may be out of power from anywhere between a few hours to a week. You’ll be forced to run a noisy portable generator to power certain appliances for a few hours at a time so you don’t run out of fuel. 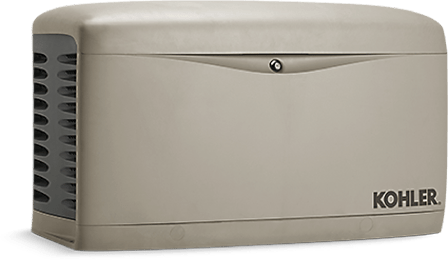 Rather than stress out about sweating in the darkness or ration fuel, have Rack Electric perform a standby generator installation. When the power line falls and breaks, your home loses power within a few minutes. As soon as the backup generator detects that there’s no power running into the house, it immediately kicks on, providing the entire home with electricity. 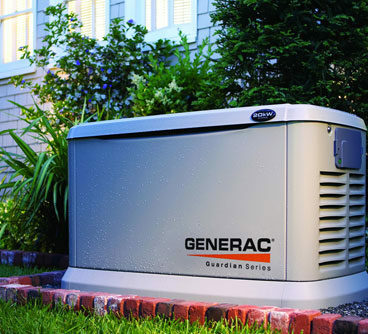 A Rack Electric installed generator can keep your house running for up to 3,000 hours, or 125 days straight. You’ll be able to continue living life and going about your business normally as the rest of the neighbor sits in the dark waiting for the lights to turn back on. 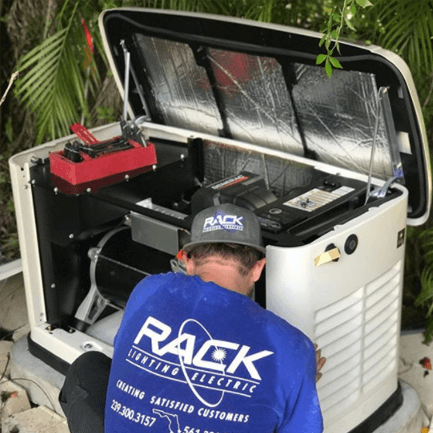 As the number one generator installers in Boca Raton and the rest of South Florida, Boca Raton is fully equipped to install a standby generator long before hurricane season ever arrives. We’ll provide you with a free generator installation quote before sending out a team of expert electricians. We understand that your time is extremely valuable, which is why we ensure that the dispatched team will properly install your brand new emergency power standby generator in the shortest amount of time possible so you can get back to your life. Rack Electric also offers electrician services to both residential and commercial clients across South Florida. Whether you need us to help replace old wiring for your home entertainment system or install overhead lighting for your office space, Rack Electric is there for you. Contact us today to receive a free quote on your generator installation or electrical services by calling (561) 391-3550.